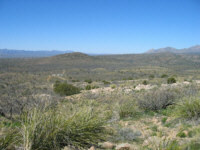 The property consists of one 599 acre parcel. 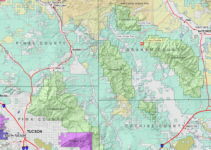 The parcel is surrounded on three sides by State Trust Land and abuts the Coronado National Forest on the eastern boundary. Elevation ranges from 4,600 ft. to 5,100 feet above sea level. The Lazy Double S Ranch has a colorful history that dates back to Arizona Territorial days. 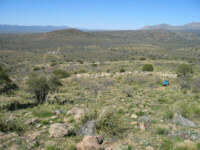 This area was the site of the Cedar Springs Massacre during the 1881 Apache breakout. Local lore also says Billy the Kid hid nearby for a few days after escaping jail in Bonita. The views from the property are exceptional in every direction. The area is very private but has easy access to shopping opportunities in Safford. This is an exceptionally beautiful property that must be seen to be fully appreciated. 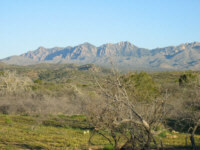 The Lazy Double S Ranch has a mild climate with summer highs in the mid 90's and winter lows in the mid 30's. Rainfall is approximately 14" annually. 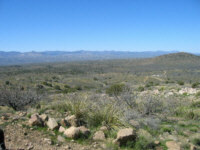 The vegetation is mesquite grassland with soap tree yucca, juniper and bear grass providing diversity. The property contains many forms of wildlife. Mammals include black bear, mountain lion, black tail and white tail deer, bobcat, coatimundi, javelina, coyote, badgers and squirrels. 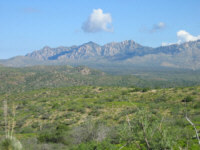 The Pinaleno Mountains are known for their diversity and abundance of wildlife. There are currently no utilities on the property but electricity could be provided by solar system or generator. Water could be provided by drilling a well. Propane is available from local providers and telephone is via cell phone. Please click here to download (about 1 MB) a printable brochure in Adobe Acrobat format. If you get frustrated trying to make this work on your computer, don't hesitate to ask us to mail you a printed and bound brochure instead.